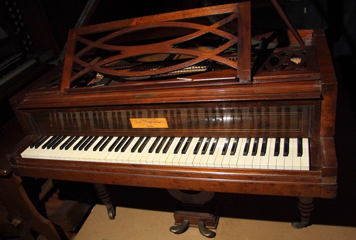 This instrument is very similar to Chopin’s own, now in the National Conservatory in Paris. Though once common, such instruments are now extremely rare, the majority having been concentrated in Paris, where many succumbed to the effects of civil strife and war, notably the Franco-Prussian War of 1870, when they were burned, together with harpsichords confiscated from the nobility during the Revolution, for warmth during the siege of Paris. This example was found in the south of France, and restored by David Winston of Cranbrook, Kent, England.(?) Bie notes Chopin’s preference for Pleyel instruments, “whose silvern muffled tone was especially attractive to him,” over those of Erard, his great rival, quoting Chopin’s own words, “If I am out of humour I play an Erard and easily find the tone there ready-made: but if I am in form, and strong enough to make my own tone, I use a Pleyel.” Certainly the action of the present instrument, though capable of almost infinite nuance and subtlety, requires far more precise touch control than that of the collection’s Erard concert grand, the inertia of whose double escapement action “evens out” irregularities of touch.